Registered Gas Installers | R.G.I. Information | About R.G.I. R.G.I.I. or Registered Gas Installers Ireland is the gas installers regulator. All Registered Gas Installers promise to provide a commitment to ensure the highest and safest standards of service for all people working and using natural gas. 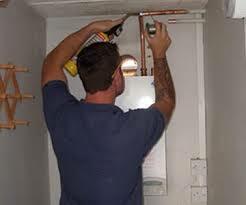 On the 5th of January 2009 the registration of professional gas installers became mandatory under Irish law. This applies to all persons who are engaged in repairing, servicing and installing appliances and equipment for the use of natural gas. This applies to domestic premises or premises of such type. The purpose of Registered Gas Installers legislation. The government decided that by regulating the gas services industry they would vastly improve the safety of all gas installations. This would reduce the numbers of accidents due to unsafe installation and working practices. If you would like to view R.G.I.I. 's customer charter, please click here. At Boiler Services Dublin we strictly adhere to all legislation and are proud to do so. All our specialist boiler service technicians are certified registered gas installers. All of our work is certified. If for example you have a boiler service conducted we will always issue an R.G.I. compliance certificate on completion. We are always happy to offer free unbiased professional advice on any boiler and heating related issues you may have. If you would like a no obligation quote on any work. Or would like to arrange an annual boiler service at a time that suits, call the experts today on 01-8326699.